How could I not start my first food blog without writing about ‘Akki Rotti’ (Rice Roti). This dish is a well known amongst kannadigas and especially in the Kannadiga Jain houses. I being one, Akki Rotti is no doubt my favorite. As a Grihini – housewife, one has to learn this process of making Akki Rotti. It’s like a benchmark for all housewives; who can make the best Akki Rotti’s in town! However, during one of my summer vacations at my Doddamma’s (My mother’s elder sister) village, I made an attempt to learn. Doddamma is very kind and sweet lady. She taught me in an easiest way to make one. I did try making a few and it came out pretty good. And after that I never got a chance to make one. So today, I tried. And it’s for all you to see how it turned out. Of course, for those who have seen it or eaten it before may laugh at the look of it, but believe me for a second timer it was not bad at all. 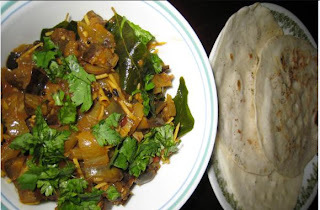 I made ‘badenekayi palya’ (Eggplant/Brinjal) to go along with it. But this version is a little bit different. And one good thing about this is that, there is no need to use oil – healthy isn’t it! In a bowl, mix rice flour and salt. 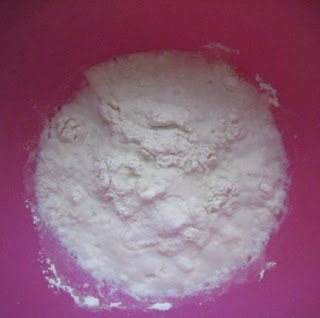 Boil the water and pour it on to the flour mix. Let set for couple of minutes or until the water gets warm enough to knead the dough. Make dough just fine enough to be able to spread. 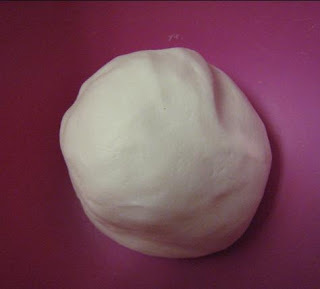 (Similar to chapathi dough). Add cold water if required while mixing. Make lemon size balls of it. Wet a kitchen cloth (I used a new hanky) and spread it over the flat base. Now, spread the dough on the cloth with your fingers/palm until u get a round flat Rotti. Heat the tava. Carefully, transfer the Rotti from the cloth onto the tava. 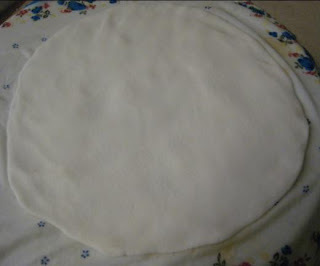 Using the same cloth, spread a layer of water over the rotti, just enough to wet it. Wait for a minute. Turn it over. Allow it to cook for another minute. Turn it over again. And with a wooden saddle, gently press the Rotti on all sides, so that it slowly blows up. And then, transfer it to a plate. Serve it with your favorite curry. I have used a wet cloth to spread the Rotti dough. Typically back home, they use rice flour instead. The rice flour we get here in the US Indian grocery stores is not ideal for making this type of Akki Rotti. Back home, I remember my mother, washing rice with water several times and then allowing it to dry by spreading it over a cloth for days. And then taking it to the Flour Making Mill to get Rice Flour. Akki Rotti’s made from this flour turns out very soft and white too. Thanks Asha. It must have been fun growing around coffee plantations. Tmrw. 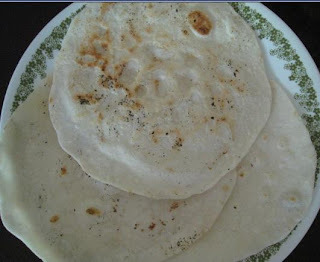 i m going to prepare Akki rotti for the 1st time in my life... so, i searched lots of web sites for this. But finally when i read and saw ur site i felt this the best and i m going to try it tmrw.. thanks bye. This is the easiest way of making akki rotti that I have come across. I had a tough time patting the rottis directly on the tava. Even using plastic sheets was clumsy. Using cloth is a much easier option, healthier as well (no oil required). I tried it out today. It was amazing. Thank you.